A person registered as a composition tax payer has to become a regular tax payer when his/ her turnover crosses Rs. 50 Lacs (in Special Category States except Uttrakhand) and Rs. 75 Lacs (rest of India). There can also be a scenerio where a composition tax payer chooses to become a regular dealer voluntarily, though his/ her turnover does not cross the threshold limit. In this blog, let us understand the process to be followed by a person to withdraw from the composition scheme and become a regular tax payer. A composition tax payer who wants to become a regular tax payer should file an intimation for withdrawal from the composition scheme in Form GST CMP - 04. If the move is because the person's turnover crosses the threshold limit, then Form GST CMP - 04 should be furnished within 7 days after becoming liable to register as a regular dealer. Note that an intimation for withdrawal from the composition scheme will be considered as withdrawn for all the places of business registered under the same PAN. The person moving to the regular scheme has to furnish a statement in Form GST ITC - 01 containing details of the stock of inputs, inputs in semi finished or finished goods held on the day before the date on which he becomes liable to be a regular dealer. Furnishing of Form GST ITC - 01 enables the dealer to claim ITC on inputs, inputs in semi - finished or finished goods and capital goods in stock when he/ she becomes a regular dealer and it has to be furnished within 30 days after filing Form GST CMP - 04. For Example: Mohan cakes is registered as a composition dealer in Kerala. Its turnover crosses Rs. 75 Lacs on 15th November 2017. Mohan cakes has the following inputs in stock as on 14th November, 2017. Mohan cakes has to furnish these details in Form GST ITC - 01 and it will be able to avail full ITC Form GST paid on inputs of Rs. 22900 (GST paid @ 5% of Rs. 8500 + GST paid of Rs. 14400) on closing stock. Hence when a composition tax payers turnover crosses the threshold limit, it is mandatory for the person to withdraw from the composition scheme and become a regular dealer within 7 days after crossing the threshold limit. 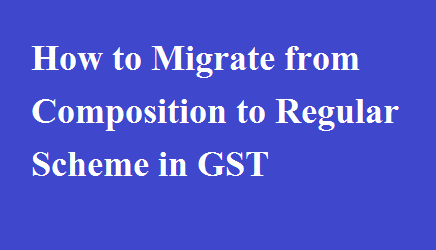 Persons who move from composition scheme to regular scheme should ensure that they furnish Form GST ITC - 01 in order to claim ITC on their closing stock.